It's already three months since Genlias closed down. So, how do we live without it, and how does its successor Wie Was Wie fare? Time for another look at the site, based on the questions you asked. Several people complained that Wie Was Wie is harder to use than Genlias, but the main problem that most of you have is the lack of an English interface. An English interface is promised, but unfortunately there is no published information yet about when it will come. In my opinion this should have been available well before Genlias closed down. Dear Wie Was Wie team, please work on an English interface as soon as possible! If you have a hard time figuring out how to search at all, I'll give a short explanation. There are two ways to search: From the home page or from the search page. 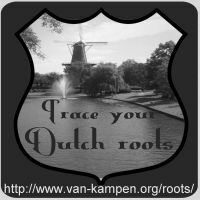 On the home page you can enter your ancestor's name in the search box (in the blue rectangle) and press the Zoek button. If you need a more flexible search click the Uitgebreid zoeken link, which will take you to the search page. There you have fields like Achternaam (surname), Voorna(a)m(en) (Given name(s)), Periode (Time frame), and Plaats (Place, usually municipality). There is a Voeg een persoon toe button if you want to search on two names (which was standard in Genlias). I can give full instructions, with screenshots, in a future article, if needed - just leave a comment if you want that. If you have too many search results, you can narrow them down by using the filters on the left hand side. That's a big improvement over Genlias! The most interesting ones are Periode (Time frame) and Collectiegebied (province or country). The software is still not stable. As a result, the website is sometimes hard to reach (or hard to use if you reach it). The team is aware of it and working on it, but I wish they had sorted that out before Genlias closed. On the bright side, all functionality is free for the time being, at least while the platform is not stable. Eventually they want to charge for advanced search (including searching for two names), sorting and filtering of search results, and notifications. For a while it seemed that nobody knew exactly what was in Wie Was Wie, and what not. But recently they provided more information about which records can be found in their database. You can download a list (PDF or Excel) here (top right of the page). For many records there is also a scan of the corresponding document available (but you need to register before you can download or view it). However, the option to directly order and pay for a paper copy (that we had in Genlias) apparently disappeared. If you need a copy of a document you should contact the curator of the document (listed under Erfgoedinstelling) directly. And what are your experiences with Wie Was Wie so far? Are you getting used to it? Please let us know and leave a comment, below. If you have any questions about Wie Was Wie, you can also ask below in the comments. Or you can contact the Wie Was Wie team directly on twitter or facebook, they usually reply quickly. It would be nice if my biggest wish were that Wie Was Wie could have an English interface. However, I can't wish for that first, because that is not the biggest problem with the site, because it's the same whether the site is in Dutch or English or Esperanto. My bigger wish right now is that I wish it was easier to use and had a much friendlier user interface. It still feels like I am using something that is still in beta testing and does not yet feel like it is much of an improvement over what it replaced. I hate when new software or websites are rolled out that make me wish for the old version. I should be excited by the changes and find them a vast improvement. As of now, Wie Was Wie is not yet user-friendly, is not pleasant to look at, and is not an improvement. To me, Wie Was Wie was launched far too early and too far from completion. That all said, I am looking forward to all the wrinkles being ironed out and seeing it reach its full potential. I am also grateful that they are not charging while it is in this roll-out phase. It is working fine for me, the lack of English interface is inconvenient, but not unbearable, I just get Chrome to auto-translate and I can figure out what they are trying to say. I had a hard time getting Genlias to "stick" to English as well. Here's a question for a native Dutch researcher, though...what does it mean when N N is listed for the father on a birth registration? N.N., from the Latin phrase Nomen nescio, which means name unknown. Usually that means a single mother, and the name of the father not listed on the document. Is there any way to download the images once we find the record? I can link it to a family tree on the site but can I get them offsite? If you are registered and logged in, if the record is scanned, and if the owner of the record allows downloads, then there should be a download link. A lot of ifs, though. Henk, We're both into photography and genealogy. Your flower photos are extraordinary, especially the hibiscus. My ancestors emigrated from Sweden to Harlingen, Netherlands, then to America. I cannot find their Swedish city of origin, purportedly, Almerijd, Carlsheim, Sweden. Ever heard of the place? Maybe Karlshamn, Sweden? But I don't know much about Sweden. Might I suggest an alternative: Open Archives (https://www.openarch.nl/) is available in English, Dutch, German and French and provides access to the data of 40 Dutch archives. It has a powerfull Google like search engine, which also allows for searching on two names. At the moment, Open Archives has over 30 million records with nearly 80 million persons mentioned in those records. I'd like to hear what you think of Open Archives! The site does not adequately explain the source of the jnformation it is displaying. The document isl described as “DTB trouwen” which is meaningless. It sounds like some kind of database, but a database of what? Original church registers? I’d certainly like to see those. But if it’s copies of one or another of the transcriptions of the original records which I have already consulted (as the transcriptions are in the possession of various NY City institutions) — well I’ve already seen those, and if it’s a rehash of information found on public family trees (possibly even consisting of information I myself have posted on the FamilySearch.org FamilyTree) — that’s inherently unreliable and of no interest whatsoever to me. Especially if there are any plans at all to turn this into a pay site, better care needs to be taken to insure potential customers are able to know exactly what it is tgey are beingvasked to pay for. Otherwise they will either not buy at all, or go away feeling they have been cheated and nevér come back. Dates shoukd be spelled out to avoid cobfusion between those who use the DD/MM/YYYY numerical convention and those who use the MM/DD/YYY oconvention. Genealogists are supposed to know better, but using the strictly numerical abbreviation is an invitation to errors.